I used to live on this when I was a broke college student. $6.50 for at least 2 huge meals. Try finish dis one by yourself! No ways brah. 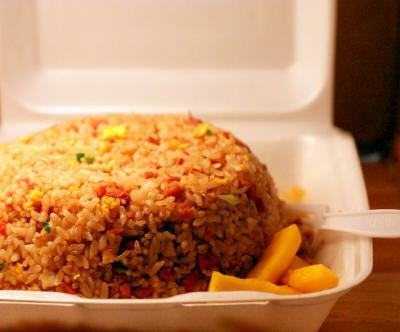 The fried rice comes shaped and compressed in a bowl shape, so when you start eating into it, it falls apart making it look like even more, as if it’s growing. Once you start feeling full, it’s like you never even make a dent! Lots of finely chopped meat in there with green onions. Tastes like luncheon meat and bacon. It’s not too heavily seasoned, so it’s easy to eat a lot of it, and it tastes great. It also comes with some pickled daikon which is nice to bite on when taking a break. Make sure to have tabasco sauce on the side because for some reason, it tastes really great with it. Kuhio Grille offers combo meals with the fried rice. My absolute favorite is their chicken cutlet w/fried rice. The fried rice goes so good with the gravy and chicken! Also try their oyster chicken w/fried rice which I hear is also really good, but never got to try yet. This entry was posted by James on Monday, January 8th, 2007 at 8:49 pm	and is filed under Fried Rice, Hilo, Restaurant Reviews. You can follow any responses to this entry through the RSS 2.0 feed. You can leave a response, or trackback from your own site. looks ono….no foget da fruit punch too brah. This makes me hungry…we always come here for breakfast after checking in luggage at the airport. After Kuhio Grille’s fried rice and portuguese sausage, I’m usually ready to say aloha to my Hilo comfort foods for a long while… And don’t get me started about their “Kanak Attack” plate! Fried rice in the shape of a bowl, how cool. Looks like the stuff my grandma makes. I live in Hilo and will never eat at Kuhio Grille again. I ate there last year for lunch and had the laulau plate. It looked good and tasted okay but that night I got soooooo sick! I called them the next day and for several days after that but the manager was in a meeting or too busy to talk now…I left my number and they never called me back. At that point I figured that they did not care about me or having any more of my business. Not sure if you got my email, but I was just in Hilo this past weekend. I’ll be back…soon enough. kelly, sorry to disappoint… i only had water! or coffee? Penny, I heard about their kanak attack… and that it is huge! I really want to try it. jodi, i’m sure your grandma’s one is a lot betta! Hawaii is the first place my older son remembers living. He thought he was Hawaiian and Chinese food was just food. When we came back to the mainland he ordered Portuguese Sausage fried rice when we went out to eat. He cried when I told them he could not get that here. That fried rice looks so good! MAN!!! You makin me homesick! I am in Honolulu right now studying at UH Manoa, but after reading your blog and seeing the pics of Kuhio Grill fried rice – I like go home! Thanks for your review, as it helped us decide on this place for one of our evening meals. Unlike one poster, we had no problems with our laulau plate– we thought it pretty good. The person who had saiman (for the first time) declared it “not bad,” but that’s her rating for most everything. (I think she didn’t know what to make of it.) Liked the fact it was reasonably busy, our take-out order didn’t take long at all, at it was a non-chain with local foods actually open on a Sunday night. I love Kuhio Grille. Very cozy place and employees are so FRIENDLY! In fact, all Hilo people are friendly. I had my favorite food,,,, Hambuger Steak. MMMM. Oxtail soup looked yummy. The other customers must have been saying, “Look at that old fart looking at our food”. Cannot help…….. everything looked great. I wish Oahu had Kuhio Grille. Jesus Christ!!!!! I am so homesick and not to mention hungry after scrolling through your website. I moved from Hilo to Florida 5 and half years ago and I miss the food alot. It has been great for my diet as far as my weight training goes…but Jesus!! I miss Hilo’s great array of local food. I think the ultimate thing that I miss is my Mom’s version of Mochi Chicken named “Mochici” (pronounced Moh-Chee-Key)by my little sister Dulce. I can’t wait to visit the Big Island again…September 07 here I come!!!!!! BTW…All the places that your website mentioned except that Mexican place which I have no idea where it is–are great. If I had a choice from your list…I think Ling’s Chop Suey house would top them all and second would be Kuhio Grille’s famous fried rice. Another place I think you should list is Nori’s Saimin Shop. Their noodles and broth totally hit the spot especially on those Hilo rainy days. Good Luck!! I just had dinner there tonight and the food was awesome. We tried the Kanak and my wife had the fried rice loco with teri pork. The laulau was huge and the kalua pig was juicy and just the right amount of salt. I liked the smoky gravy with the fried rice and teri pork too. We somehow ate all our food and then some fried icecream for dessert. A definite must when your in Hilo. Thanks Kuhio Grille we will see you again very soon. FOOD IS SO ONO I MISS HOME. Impressive issues in this article. We’re content to see your write-up. Thanks a ton and i am looking onward to contact a person. Would you like to please decrease me a mail?